Fluoride Action Network | What is the Nuclear Fuel Cycle? Source: Azo Mining | April 11th, 2019 | By Gaea Marelle Miranda, M.Sc. Nuclear fuel, despite being a nonrenewable energy source, is said to be more efficient than fossil fuels. Uranium is a radioactive metal commonly used in the production of nuclear fuel and has the potential to produce massive amounts of energy. However, to realize this potential, uranium must first undergo the nuclear fuel cycle. There are three phases encompassing the nuclear fuel cycle, including several stages within each phase. These are the front end or preparation phase, the service period where the fuel is used to generate electricity, and the back end where the spent nuclear fuel will be managed safely for either reprocessing and reuse or disposal. The front end involves several stages, beginning with the exploration for the raw material and the development of the mine from which to harvest the uranium. Uranium is a common metal present in most rocks and soils and is about 500 times more abundant than gold. Once a site has been determined to contain uranium, the mine developer may follow up with development drilling to determine how much uranium could be extracted. The next stage is mining for the uranium ores, which can be done using several techniques: underground mining, open-pit mining, and in-situ leaching. In-situ leaching, or in-situ recovery, is the most commonly used method in the United States and it is done by extracting the uranium directly from the ore. The milling stage comes next, which transforms the ores into uranium concentrates. The uranium ores are crushed, pulverized and ground into a fine powder before being treated with chemicals that cause the uranium to separate from other materials found in the ore. The product of this process is a powder called yellowcake (due to its bright yellow or orange color) or uranium oxide (U3O8). This process raises the uranium concentration to more than 80%. Conversion is the next stage where the yellowcake is converted into uranium hexafluoride (UF6) gas. Uranium consists primarily of two isotopes, U-238 and U-235. Uranium-235 is the fissile (capable of undergoing fission, which is the energy-releasing process in a nuclear reactor) isotope; however, its natural concentration is only 0.7%, which is not enough and will need to be increased to between 3% to 5%. To increase the concentration of U-235, the UF6 undergoes the enrichment stage, where it is introduced to centrifuges – thousands of rapidly spinning vertical tubes – that push the heavier isotopes to the cylinder walls. This produces enriched UF6 which now contains the necessary uranium concentration of between 3% to 5%. The enriched UF6 will need to be reconverted into enriched uranium oxide or uranium dioxide (UO2) powder. This powder is then compressed to form small ceramic fuel pellets. The pellets are then packed into long metal tubes to create fuel rods, which are grouped together to make up fuel assemblies. This final stage of the front end of the nuclear fuel cycle is called fuel fabrication. These fuel assemblies are ready to be introduced to nuclear reactors. This is the phase where electricity is generated inside the nuclear power plants. 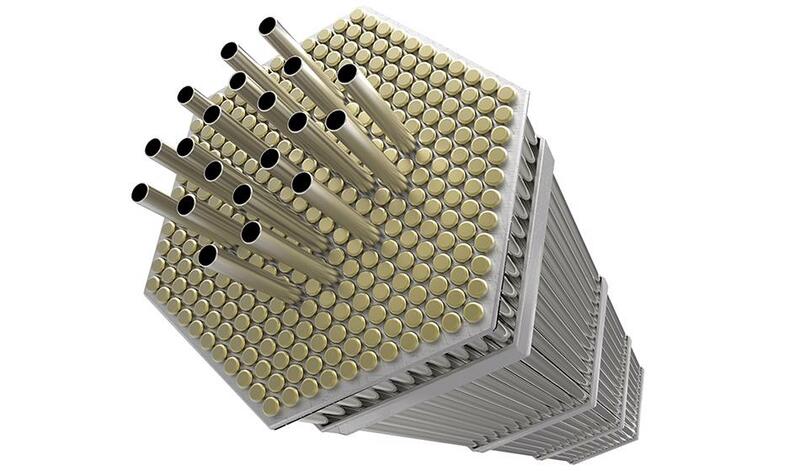 The fuel assemblies formed during fuel fabrication are loaded into nuclear reactors where controlled fission occurs. Heat energy is released during fission events and is used to heat water, producing high-pressure steam. This steam will turn turbines connected to a generator, which finally results in electricity. The fuel will be used for three to six years, with about 30% of the fuel assemblies being changed out every 12 to 18 months to maintain efficient reactor performance. Over 8 billion kilowatt hours of electricity will be produced in one year from nuclear power plants. Once fuel assemblies are exhausted and replaced they will continue to emit high levels of radiation. The spent fuel will be stored underwater in storage ponds to allow these radiation levels to decrease. The ponds will both absorb heat and provide radiation shielding and, after a few years, the spent fuel will be movable to either dry storage casks or wet storage pools. The spent fuel still contains uranium, which can undergo reprocessing, as well as plutonium and waste products. If not reprocessed, spent nuclear fuel will be disposed of deep underground where the health risks to people and the environment are minimized. At present, there are no permanent underground disposal repositories in the United States.